Quiet patience and an observant eye turn a seemingly unpromising subject into a rich and fascinating movie. The Wild Parrots of Telegraph Hill captures the life of Mark Bittner, a gentle homeless musician who's befriended a flock of wild parrots in a neighborhood of San Francisco. Following Bittner, the camera zooms in on individual parrots, revealing their individual personalities and the traits of their species. This leads to Bittner's own life, the network of friendships that support him, and the ways in which the parrots--a non-native species--interact with both the natural ecosystem and the city government; just about every topic opens up another until a flock of colorful birds represents a microcosm of nature and society. 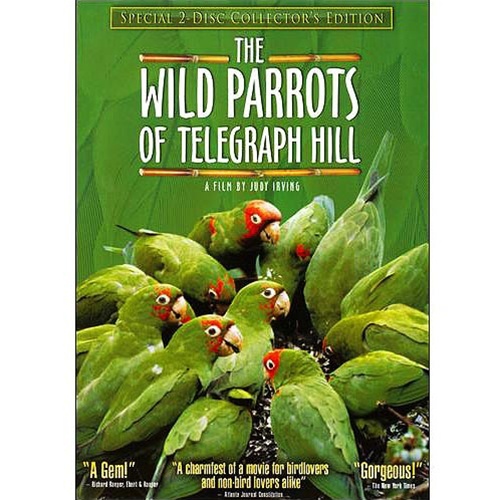 An "engrossing, delightful film" (The Washington Post), The Wild Parrots of Telegraph Hill is the bonafide sleeper theatrical hit of the year. The film's endearing guide is Mark Bittner, an aging bohemian, but the supporting cast members, a rambunctious flock of urban parrots, are the true stars, and their surprisingly humanlike behavior makes for a wondrous and rare experience. The film follows the ups-and-downs of these wild birds within the green niches of San Francisco as Bittner befriends, feeds, and names the members of the flock. Along the way, we meet many unforgettable characters: among them Connor, the grouchy yet lovable outcast of the flock, crying for a mate but luckless in his pursuits, and "the lovers," Picasso and Sophie, inseparable until Sophie is forced into mourning when Picasso disappears. More than a mere birdwatcher, Bittner finds solace in his immersion with these strikingly beautiful creatures - but how will he cope when he's evicted from his sanctuary and forced to live away from the parrots? Packed with romance, comedy and a surprise ending that "makes you feel like you could fly out of the theater" (San Jose Mercury News), The Wild Parrots of Telegraph Hill shows just how wondrously similar the human and animal worlds really can be.